?I was reading an email about “SUMMERDANCE” in Santa Barbara and saw that a “Rachel Howard” was reviewing it and had a website. I didn’t know if this was the same Rachel that slinked around the floor in 1993 with the rest of us during a fabulous rendition of Sade’s work so I checked out your website.? I am indeed the same Rachel Howard who slinked to Sade a decade ago. But let me explain. The one question dance critics (particularly if they?re female) are constantly asked is ?Are (or were) you a dancer?? Many dance writers, including Deborah Jowitt, Wendy Perron, and Gus Solomons Jr., can answer in the affirmative. Here in the Bay Area, the Contra Costa Times? Mary Ellen Hunt puts her pointe shoes on for class five days a week. My own reply is more tentative. I took neighborhood tap/jazz/ballet classes from age four to eight, quit because I wanted to ride horses instead, and returned to ballet (and dabbled in modern) in college. Frankly I was never very good: one of my legs is incurably turned-in, one of my feet won?t point fully, and I hit a solid double pirouette only once in my life. Besides, I prefer writing. But the real story is this: From eighth grade on, I was a colorguard fanatic. What is colorguard? The shortest answer I can offer, ?flag team,? is woefully inadequate. Today?s colorguard is much more evolved?and often bizarre?than those girls in knee-high boots and sparkly vests who used to stand next to the drum line. At Clovis High School, we marched alongside the band in the fall but had our own ?Winterguard? productions, performed inside gyms. Three years in a row we traveled to the Winterguard International championships in Dayton, Ohio, where we always made the top twenty. We spun flags, true. But we also danced, some of us more crudely than others, practicing jazz runs and chass?s and grand jet?s across the football field or the cafeteria floor. Colorguard began as a competition in military precision, with teams passing before the judging panels with their flags, rifles, and sabers carried in regulation formation. But by the time I joined the ?Sport of the Arts? 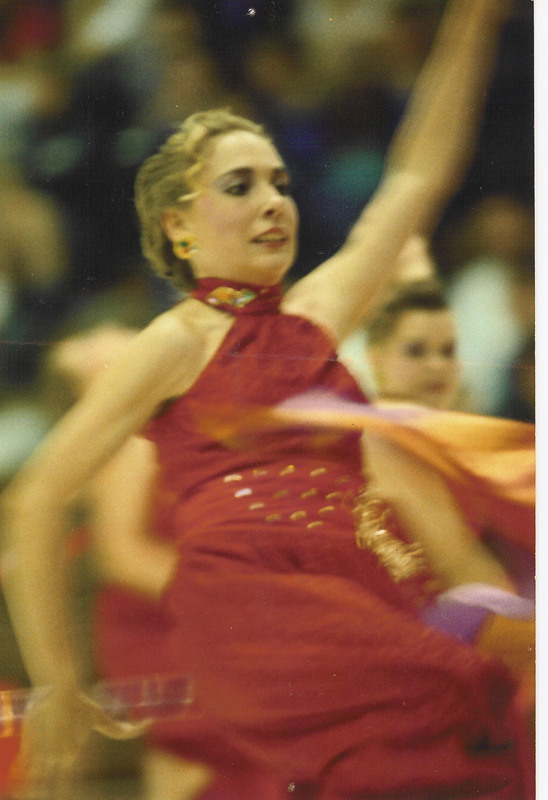 in the late eighties, west coast troupes had introduced dancing, upping the ?artistic? ante. With Clovis High colorguard, 1992 (the year before the Sade show). The supressed terror on my face is because I’m afraid I won’t catch the flag pole behind my back. The year before I entered Clovis High, the colorguard performed a ?Swan Lake? to truncated Tchaikovsky, transforming the cygnets’ dance with crisp flag tosses. While I was in colorguard I saw routines danced to everything from Edgar Allen Poe?s ?The Raven? to Billy Joel?s ?Piano Man.? I even remember a rendition of Samuel Barber?s ?Adagio for Strings? performed, with flags, en pointe. My senior year of high school, our rivals at Clovis West donned long black dresses and skittered around the perimeter of the basketball court, pausing to pulse their torsos urgently. No one from my school recognized the costumes and the movement as deriving from Martha Graham?s ?Night Journey.? We just thought the Clovis West instructors had gone kooky. The Sade show came my junior year at Clovis High. It was a work of high camp fantasia, designed by a glamorously hip instructor named Marc whose last name, regrettably, now escapes me. We slithered and winked to ?Smooth Operator? and ?Cherry Pie,? wearing sparkly red pantsuits and enormous falls of fake ?Barbarella? style hair. We had a purple vinyl floor with a diamond of white fake fur across which we crawled, suggestively placing our sabers between our teeth. I have the videos to prove it. Also in my senior year, I moved up into the ?A? corps of the Concord Blue Devils, an independent drum and bugle corps I marched with in the summers. Or should I say the World Champion Blue Devils. We won again that year in Boston, before an enormous, roaring crowd, with ?My Spanish Heart,? a show designed to the music of Chick Corea. I was on the saber line that year. I could throw a Marine-style ceremonial sword in the air, watch it rotate seven times, and stop the metal blade dead in my hands before dancing off in a new direction. Ah, the nostalgia! The Blue Devils are gearing up to take the championship field in Denver tonight even as I write this. I?m with them in spirit. Obviously colorguard wasn?t the School of American Ballet. I couldn?t hold a decent arabesque, but I could twirl a full rotation beneath a saber toss. I didn?t get my dance history until college, but I learned a thing or two about choreographic phrasing, spatial patterns, and the workings of muscle memory. I put in more work than you might imagine (the Blue Devils often practiced from nine in the morning to ten at night, sleeping on hard gym floors as we toured the country). And I had a hell of a lot of fun. I think colorguard is a fascinating American subculture?kind of marching band meets Cirque du Soleil. Its participants are passionate?until my senior year of high school, I was determined to make a career as a colorguard instructor. Did I take the right route? I think so, but I miss the warm summer evenings with the mosquitoes buzzing around the stadium lights as we prepared for a final run-through. I?d like to write about colorguard someday. I just haven?t figured out how yet. Hello! I came across this site somehow and I am so glad I did. I marched in Phantom Regiment Winterguard for many years. I am now an instructer with them. It is so interesting finding a blog that talks about colorguard, because it is still a very unknown lifestyle. I hope you do one day write about our “little serect” one day.